Remember the Vinyl Bib Tutorial? 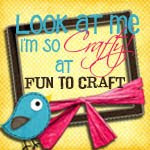 One of my readers from Taylor Moments sent me pictures of the bibs she made from my tutorial. Don't you love the tablecloth??? Also don't you love that she put a cutie patootie button on there! She said that she actually bought this tablecloth (from TARGET...insert love and devotion for Target here) for a drop cloth but decided to use it on the bibs. Imagine my delight and surprise when I found the tablecloth she used and the above fishy one while wandering around my local Target. I immediately snatched them both up. 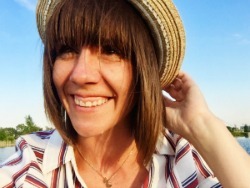 Then later that day as I watched my littlest man delightfully drop his tiny pb&j pieces all over the floor, my sometimes working light bulb went off, connected the two and we got ourselves a High Chair Drop Cloth. Cut out 2 pieces of main print in a square to desired size. I measured mine at 38x38 since my littlest man likes to toss AND throw. Cut out 2 pieces of coordinating print into a rectangle to fit within main square. I cut out two here, because I wanted a clean folded edge when I attached it to the main print. I couldn't "applique" it on because you can,t iron vinyl...what??? Really? No really it is true. It will make more sense in a couple of steps. Fold rectangle in half hotdog way...remember what you learned in kindergarten? Trace half of a simple outline of a fish. I tried to match the one on the main print. Once you have your pattern, cut while still folded. Repeat with other rectangle piece. Unfold and line up edges with like sides facing. Pin together. Don't stress if the print doesn't 100% match up, only one side of your fish will show...this is that faking the applique look part since you can't iron. Sew with a 1/4 inch seam around entire fish, leaving an opening for turning out. Turn out carefully. Vinyl will tear easier than fabric. Once turned out, fold in the edges of the opening. Sew opening closed, outlining the edge. DO NOT outline the entire fish yet. Place your fish on your 1 piece of your main print. Once it is centered, pin it in place. To attach the fish, start at the beginning of where you original sewed close the opening. Sew over those stitches and then continue. Keep going until the entire fish is attached and outlined all cute like this. 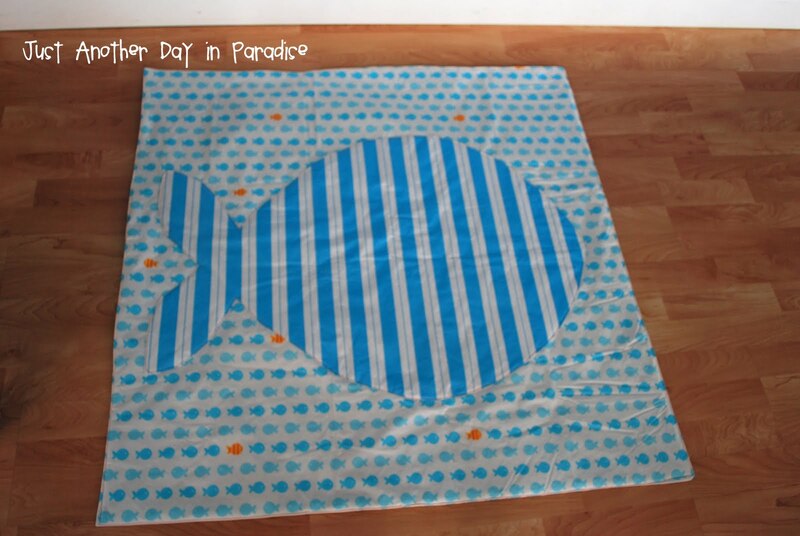 Once the fish is attached, lay your other piece of the main print on top, like sides facing. Pin around the edges. Sew around the entire square with a 1/4-1/2 inch seam, leaving an opening to turn out. Turn out. Once it is turned out, outline the edge of the drop cloth like you did the fish. 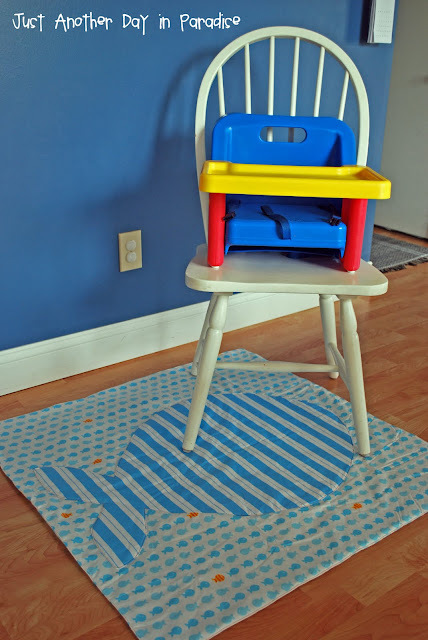 Now as your little eater continues to test the laws of gravity with his/her lunch, you can rest assured because you have a cute little drop cloth keeping at least this square of your floor clean. That is too cute! Great job! WOW, you are good! Very good tutorial and pictures! That is so cute and clever way better than any of those high chair drop cloths I have seen. Thanks for stopping by. I am a follower for sure. That would be nice to take along to sit on when you go out for a picnic. Just throw a blanket on top and it's cozy. Very cute! My girls aren't in high chairs anymore but they're still messy, so I could still use something like this! LOVE this and will be making it for our new place! Thanks for the great tutorial! I'm loving this. Thinking bout making one, then I remembered my dogs solve this problem for me. In fact, my dogs usually catch it before it hits the floor as my little man hands it to them. HAHA. So cute though. I think it would make a great gift! I'm a new follower! This is such a great idea! And it's super cute- bonus! Thanks so much, I'll be linking. I actually bought several of these tablecloths to make waterproof bags - they were only $2 at Target! Was it difficult to work with and did you use a heavy duty needle? Any advice is greatly appreciated. Awesome awesome! I too have an amazingly messy toddler who loves to THROW her food! And I happen to have a cute vinyl tablecloth lying around.....PERFECT! :) Thanks for the Tute. i've got the same cloths! i used them for a birthday party! if i still had a baby in a highchair this would be perfect! Another idea with this. Get a cheap piece of scrap linoleum from your local hardware store, cut to size, and cover with this. It will stay in place better that way and still look cute! (no more scooting around as you attempt to wipe/mop it up! If you're setting it up on carpet, you can use one of those desk chair mats.